महासागरीय लवणता में विभिन्नताओं के कारण बताइए तथा इसके बहु-आयामी प्रभावों की विवेचना कीजिए. (Definition) Salinity is the the total amount of dissolved salts in sea water. It’s generally expressed as parts per thousand (ppt). Oceans between 20 to 30 degree North and south have high salinity because of (1) high temperature (2) low humidity . Temperate oceans have lower salinity due to lower temperature. Equatorial waters have lower salinity due to heavy rainfall and high humidity. Oceans fed by large rivers like Amazon, Congo, Ganges, Mekong etc have lower salinity. Melting of icebergs and resultant fresh water intake into Baltic, Arctic and Antarctic ocean waters makes them less saline. Thus, global warming and greenhouse gas effect has indirectly affects the salinity levels of the oceans. In open oceans, currents mix and flow freely, hence salinity is average 35ppt or lower. Whereas in the Caspian sea, Mediterranean sea, Red sea and other wholly / partially enclosed seas – the fresh water doesn’t mix freely with ocean water hence salinity is higher. Salinity, temperature and density of water are interrelated. Hence, any change in the temperature or density influences the salinity of an area. Because of density difference: (1) High salinity seawater sinks below the lower salinity water and; (2) Cold water sinks below the warm water. Therefore, the cold water at the poles sinks and slowly moves towards the equator and warm-water moves from equator to poles to replace the sinking cold water. Thus salinity has a great role to play in the formation and circulation of oceanic currents via the thermohaline process. Since Earth’s temperature and rainfall is affected by currents, the level of salinity has indirect role in Earth’s overall climate. Salt water has a much lower freezing temperature and without salt more of the oceans would freeze during winter- affecting the movements of both fish-schools and cargo ships. Despite having no fins, the plankton are kept perpetually afloat due to the density of seawater. Without plankton, entire marine ecosystem will collapse, the atmospheric levels of oxygen will be altered- posing threat to all forms of life even on land. Whales, sharks, sea-cows and other marine species can grow to be so much bigger in size than the ordinary animals on land. Salt affects water’s freezing point and salinity affects circulation of cold and warm currents. The marine organisms have accordingly adapted to a particular level of temperature, pH and salinity. Human-induced changes in oceanic salinity threatens their survival. Example, certain oceanic fishes lay eggs on the grounds near estuaries. With right saline density, the eggs will remain there until the fish is born. If it changes- the egg float to surface, and become easy feed for the predators. Avoid SWIMMING towards environment angles like coral bleaching, mangroves destruction etc. Salinity-changes could have indirect impacts on them but writing too much about the side-issues will degrade the quality of answer. Oceanic salinity is affected by factors such as temperature, ingress of fresh water and mixing of currents. Oceanic salinity plays important role in the growth of marine organisms, circulation of oceanic currents and distribution of temperature and rainfall across the globe. Thus, it’s suffice to say oceanic salinity plays a crucial role in the survival of both marine and terrestrial lifeforms on Earth. I’ve assembled the answer using NCERT Class11, Goh Cheng Leong and little bit of internet research. Ofcourse in real exam, not possible to have divinations about how salinity helps the fish eggs’ survival and how it increases the size of marine animals. But as long as you vaguely hint the significance of salinity in marine organisms, it’s sufficient. Salinity affects a ship’s buoyancy. Ships will float deeper in fresh water than in salt water. Thus if oceans were madeup of fresh water, ships would consume much more time and fuel to move forward. नागिन चूहे को खाकर फसल को बर्बाद होने से बचाती है लेकिन उसी नागिन के डसने से आदमी मर जाता है. लेकिन नागमणी पाने के लिए वेसे भी आदमी नागिन को मार ही देता है, इसलिए नागिन के पास आत्मरक्षा के लिए जहर होना बहुत जरूरी है क्योकि अगर नागिन पे पास जहर नही होगा तो न तो व् चूहा खा पाएगी, न तो आत्मरक्षा कर पाएगी… that’s not multi-dimensional effect of poison. It’s a pedestrian answer written by a school-child. cold currents move from pole towards equator due to thermal gradient. Cold water at poles sinks due to high density. Low pressure is created at pole due to high temperature due to which cold currents tend to move towards equator to occupy warm water space which goes up due to vertical circulation.so cold currents flow below surface towards equator and warm currents on surface towards pole. 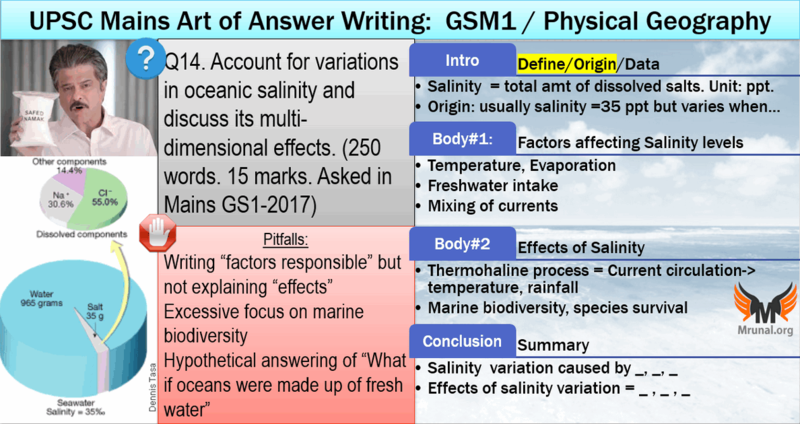 Question asks specifically for just the ‘variation’ in the ocean salinity and its multi-dimensional effects not the factors responsible for this variation. Although the factors can be mentioned in a few lines but they should not form the main body of the answer. The variation – horizontal, vertical. Variation in salinity in coastal areas, seas, bays, estuaries and their multidimensional effects should be the central theme of the answer.